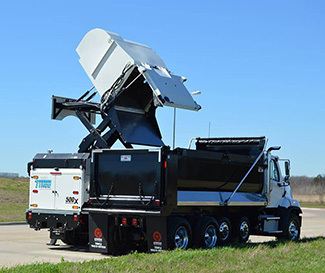 Dump Height - Variable: 2-feet to 11-feet. High resolution, color LCD multi-function touchscreen display that provides the operator feedback on the status of the sweeper and auxiliary engine. The display provides information for all safety equipment, as well as lifetime and trip hours for sweeper equipment such as the gutter brooms, pick-up head, pick-up head broom, and blower. The display also provides service hours for the auxiliary engine and hydraulic system fluids and filters. Multiplexed electrical control system which provides intelligent safety features and assists in sweeper troubleshooting with on board diagnostics (OBD). Specific to the Model 500x, BlueLogic pauses the dust control system when the blower is turned off, maintains blower at constant speed and monitors the hydraulic level/temperature shutdown system. BlueLogic also provides several safety interlocks on Model 500x, i.e. disabling the transmission if stabilizers are down and disabling blower when hopper is raised/hopper door is open. The Model 500x hopper capacity is over 5.7 cubic yards and ensures owners a payload of over 6000 lbs. All 500x hopper body sheets as well as the hopper screen are fabricated with low carbon, high chrome stainless steel providing additional longevity and easier cleanout of the hopper. A variable dump height from 2 feet to 11 feet allows dumping into various size and type containers. The large hopper door allows easy dumping and is hydraulically and mechanically locked for an air and watertight seal. The large stainless steel discharge chute project debris provides smooth discharge of debris into the middle of the dump container without the need of a hopper side shift. The chute is designed to float 45 degrees upward, preventing major damage should it come in contact with the debris container. 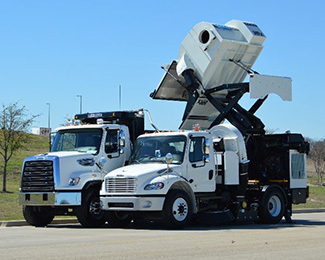 The TYMCO Model 500x® is equipped with the Broom Assist Head (BAH) which incorporates full-width air blast and suction and is designed to work effortlessly with the TYMCO Regenerative Air System to pick up a wide variety of street debris from light trash and leaves to heavy dirt and gravel. The BAH is controlled by the operator in the cab by a single switch allowing broom-assisted sweeping only when needed because the majority of debris is removed by the powerful TYMCO Regenerative Air System. 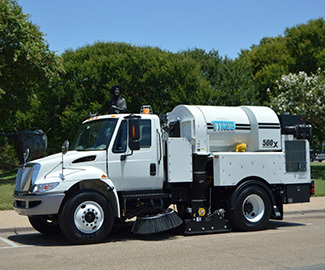 The Model 500x is the only street sweeper on the market with a high-efficiency centrifugal dust separator for maximum fine dust particulate separation which provides excellent dust control while using less water. The Model 500x has a water capacity of 250 gallons which provides hours of sweeping while maintaining excellent dust control. Every TYMCO model is built with less moving parts than mechanical and vacuum parking lot sweepers. Combine that with grease-free maintenance and Tymco's have the lowest maintenance cost of any street sweeper. The 43” diameter Model 500x gutter brooms remove debris from curbs, gutters and around obstacles along city streets such as parked cars and maintenance equipment. The Model 500x is powered by a 115 horsepower John Deere auxiliary engine. This engine powers the blower and all hydraulic functions through three direct driven hydraulic pumps. TYMCO’s engineers designed the Model 500x with a single speed auxiliary engine; therefore reducing wear on the engine and conserving fuel by maintaining a constant speed. 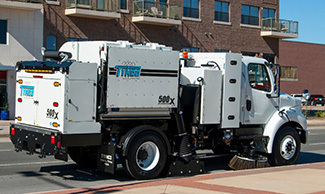 With a fast dump cycle of less than 68 seconds and a soaring 11 foot dump height, the Model 500x provides more versatility than any other high dump street sweeper on the market. Less time dumping means more time sweeping.